The twenty-second of June 1836, a warm drizzly day in London...and so start's Diane Atkinson's highly readable book on a victorian beauty who in just nine days was ruined in a court case. The story though is far more than the court case; albeit one that was charged with scandal and interest involving not just Caroline Norton but her husband George and the Prime Minister of the day Lord Melbourne. Melbourne was accused by George of having a criminal conversation with Caroline: an affair. Among those observing the proceedings and the verdict where George Norton's case was not upheld was Charles Dickens.For Caroline though, and despite the court finding for the defendant (Lord Melbourne), she was near destroyed: her marriage all but ended, her reputation tarnished, monies she earned through her own writing taken by her husband and worst of all her children removed from her care and with no legal right or call to have access to them. What follows is a story that is tragic, frustrating, comedic (at times) and shocking. George Norton was a bully and a wife beater who shunned his children and their development to the point of risking their well-being. He held grudges, was petty-minded, devious and dishonest - he was also a magistrate for 36 years. Prior to the court case he had used his wife's beauty, writing career and social connections to further himself; after he used it to pursue her and finance himself. Caroline was certainly beautiful but also a loving mother who wanted love, respect and partnership from her husband. She received none of these and cultivated the friendship of Lord Melbourne - to this reader she certainly was having an affair but how could I condemn her when her evil husband bruises and breaks her.The book provides a view of even at this high level in victorian society how women had no rights or redress. It also tells of the complex family of the Nortons and the struggles with consumption and other everyday killer diseases. It also exposes concerns in high victorian society of what granting women rights - or simply put giving women their own independent legal identity - would do to their world. I was first drawn to this book by the title as I assumed it would be about crime/murder in the 1800s. I leave it wondering now why Caroline Norton is not known in the same vein as say Florence Nightingale.Mrs Norton's Criminal Conversation was a story of perseverance, anger, frustration and activism (although she would not recognise the last) that changed British law and women's lives. Her legacy shines over the proceedings, decisions and laws for women seeking child custody and financial assistance to this day. 3½It's sobering to think that even as late as the 1830s any children born in a marriage were entirely the father's. If the marriage broke up, whatever the circumstances, a mother could not make a claim for custody as a wife had no separate legal existence.This book is the story of Caroline Norton, the breakdown of her marriage and her subsequent fight to get the law changed when her husband refused to let her see her three young sons.Caroline was a young, clever, flirtatious and beautiful woman when she married. The marriage was initially reasonably happy but her husband soon proved himself to be a drunken, boorish individual who thought nothing of giving Caroline a good beating to try and bring her into line. He hit her so hard when she was 8 months pregnant with her 4th child that she miscarried. When she eventually left him for the final time, being no longer able to cope with his violence, he refused to let her see 'her boys' and constantly used them as a bargaining tool when it came to the financial details of their separation.Despite Norton's vile behaviour and wife beating tendencies, the law was always on his side.Well written and very interesting. Caroline Norton is the epitome of all that was outrageously wrong with the law when it came to women, property and marriage. Her husband was a violent, sadistic man who regularly beat her, who was avidly jealous of her and her famous (Sheridan) family. He was also, it seems to me, in a perverted way, very much in love with her. Caroline may or may not have been unfaithful to him. George was definitely unfaithful to Caroline. She left him several times after a violent attack, but then returned - thus, according to the law, condoning his violence and making it impossible for her to sue him for cruelty. She tried to leave with her children - three boys, at the time all under 10 - and George took her children from her. Thus began the long, painful, horrific battle to get them back which resulted - too late for Caroline - in the Infant's Custody Act. Later, Caroline's campaigning was influential in the Matrimonial Causes Act, and to a lesser degree the first of the Married Women's Property Act. Caroline was an incredibly strong woman with a cause. She was a beauty, a wit, she supported herself with her pen, and she had a host of friends and admirers. She was - when permitted to be - a devoted mother. I am filled with admiration for her and yet I found myself - despite very much wanting to - unable to warm to her. Primarily, I think, I believed, as the author does, that she did have an affair with Lord Melbourne. Now, I get completely that she couldn't ever admit to this because it would endanger her custody battle - because the good old patriarchal law thought adultery in a wife a heinous crime, while it turned a blind eye to adultery in a husband. So am I wrong to find her denial - I'm not sure what the word is - not hypocritical but something like. She painted herself in such a perfect light, it just got under my skin. Similarly, in many of her letters there was a decidedly self-pitying tone. Again, with great justification, she was treated abominably by her husband and her family - but she seemed so ungrateful for all the other help she got esleswhere, nothing was ever good enough for her. Was this a result of her singular beauty? There's a bit of me that thinks so, though another bit of me that thinks that's wrong of me to judge her. But there you go, I judged her. I simply didn't like Caroline. I thought she was an amazing woman, but she's not one I'd lik to have coffee with. That aside, this is an excellent book if you're interested in the injustices of the law, which is one of my favourite topics. A case study that takes your breath away, and makes you wonder at all the many other women similarly suffering in silence. The historical context and the story are totally compelling. It illustrates in graphic detail early Victorian womens' total lack of right to govern their own affairs, enjoy the fruits of their own labours or enjoy the company of their own children. Caroline Norton was fortunate to be part of society, intelligent and articulate and have the intellectual ability to wage the battle. However, it was all consuming: it inevitably foreshortened her life and had long lasting consequences for the lives of her children, who also all died prematurely. At the end of the day this is a story about the misery of victorian properness and the cost of respectability, as governed by the society of men.On the whole the book is well-written. However, in a few places the chronology lost me: little trips backwards to prior incidents left me re-reading passages to check I'd understood the sequence of events. Perhaps it was just me?Separately I felt that the author was too ready to interpret Mrs Norton's correspondence with Lord Melborne in a way that it did not fully support? Where Diane Atkinson cites excerpts and frequency of correspondence as evidence of passion I see evidence of a seriously depressed woman, living with an overbearing, violent and intellectually inferior husband. Similarly, whilst Mrs Norton didn't always act to smooth over situations with her husband (throwing his hubba pipe out a coach window had a predictably violent effect on this particular man ...) it also seems that she was determined to behave properly. She had many admirers and flirtations (set against the dark backdrop of her marriage) but she also knew about the bounds of propriety. She also set herself up in earnest to support her family and her husband with a degree of 'proper' loyalty and commitment that underline her properness.George Norton comes across particularly badly. Not only does use his wife's connections to gain respectable employment - it turns out he had little (if any) income of his own (and had misrepresented his position to her mother), he's then more than happy to live off her earnings. He was weak and easily influenced by other vindicitive people to the extent that he would do their bidding against her. The account also gives the lie to the accepted notion that domestic violence in Victorian times took place behind closed doors. Anyone who knew the couple would have been in no doubt about the violent undertones of Norton's behaviour towards his wife. It suits us today to pretend that domestic violenece in the upperclass took place invisibly, but the reality was that alongside other mistreatment, violence towards women was accepted and condoned by others in society. One of the great sins of victorian society was the conspirace of silence and tacit acceptance of events that could only ever have been repugnant.This is a book worth reading on very many levels: as testament to an exceptional women in adversity and/ or as a social history account of the ills of Victorian society. A fascinating insight into the life of a woman who was very much at the mercy of her domineering and manipulative husband. Poor Mrs Norton (nee Sheridan) had a pretty grim existence thanks to women not being recognised in law. She was a pioneer in trying to get small changes made specifically in regard to women having custody of children. It was a really thought provoking book that demonstrates how much things have changed. Highly recommended if you enjoy reading about social history. The prologue begins with a newspaper article from 25 June 1836 detailing the excitement that Caroline’s trial is causing. She was caught up in the politics of the day, her husband using her to try and oust Lord Melbourne. It seems bizarre with our modern day laws, that a husband would sue for damages (of almost a million pounds in today’s value) for the loss of his enjoyment of his wife’s body but in 1836, this was a very real law that affected real people’s lives. In the past, the men would have been able to sort their differences by duelling (it makes me think this would probably have been a far better way than everything being made so public) but having been outlawed in 1815, this was George’s only recourse.In the account of the trial, we learn about the real people involved (Charles Dickens was one reporter) and the real places they visited for refreshment (coffee stalls, pie shops, street vendors). We come to understand how important servants were in cases because they knew everything that went on behind closed doors. This really brought the past to life for me. With my great, great grandfather moving to London in 1832 I have no doubt that with this high profile case, it is highly likely that this trial would have been part of his conversations.After the account of the trial we get to know Caroline and George as people. The family history is fascinating and I loved reading about the literary circles and the fashions (for example the wedding clothes in the late 1820’s). As the picture builds of their married life we witness George’s tendency towards domestic violence … and how weak he is being ruled by his brother.Although Caroline was found not guilty she could not divorce George. Estranged and living apart, she didn’t have the right to even see her children. Using her contacts and her literacy skills, she was motivated to be involved in passing the Infant Custody Act of 1839 which was the first piece of feminist legislation. Caroline was still not allowed to have her children with her. It was a tragic accident that finally led George to agreeing for her to be a part of the children’s lives.The Criminal Conversation of Mrs Norton is beautifully written. With all the facts Caroline’s story contains, at no point is this dull or boring. Social history comes alive – the politics and the way of life.George put Caroline through deeply emotional trauma with his obstructions and trying to ruin her reputation publicly. Still she struggled on to gain rights for women. I think it is fabulous Diane Atkinson has brought to the public attention this story of a woman who was so important and yet I am guessing not many people know of the part she played in gaining women’s rights.I’ll leave you with a quote from page 423:“Caroline Norton is a heroine to every woman who has made a mistake in judging a man.”I would like to thank the publisher for providing a copy in exchange for an honest review. It's a shame that Caroline Norton is remembered mostly for the relationship with Lord Melbourne that resulted in the 'criminal conversation' trial of the title, because her life and legacy were both so much more than that. Whilst she was certainly what we would consider an accidental feminist, having no desire for or belief in the equality of women with men, she certainly fought against the injustice of the position of women in society, and several of the first 'feminist' pieces of legislation were passed due in no small part to her pamphleteering and political agitation.Caroline Norton's life was defined by her husband, and it is that and not the 'crim con' trial that was the central feature of her life. It makes for hard reading - year after year after year Caroline's existence was curtailed and constrained by her husband's spite, cruelty, inconsistency, lack of honour or gentlemanly feeling, and hypocrisy. Caroline had literally no legal recourse - the law did not even recognise her legal existence outside of that of her husband. He could bar her from her home, refuse her a living allowance, deny her access to her children, slander her name, and there was nothing she could do. It is hard to judge whether George Norton was genuinely without conscience or compassion, or whether he was a weak man who was intimidated by his clever, beautiful wife and manipulated by his overbearing spiteful brother, but either way he utterly ruined Caroline's life when he married her.And yet the greatest irony is that when George Norton and his elder brother Lord Grantley died, it was their connection to Caroline that was most remarked upon. She fought back, with any and all weapons she had at her disposal; she refused to go quietly or accept her husband's tyrannical behaviour. She was a poet and a novelist of great repute; a society beauty with many connections; a woman who won the public sympathy by refusing to suffer in silence. There is much to admire in Caroline's life, and her story is well-told, for the most part. Diane Atkinson's sympathies are quite clearly nailed to the mast from the outset, and whilst it is a shame very little of George Norton's words have survived to tell his side of the story, it is hard to see how his behaviour could be spun in any positive light. My one criticism of this book is that it occasionally reads like a very educated academic author trying a bit too hard to write for the average reader. The tone for the most part is engaging and erudite without being pompous, but every so often colloquialisms or informal phrases or notes creep in that I found jarring when reading history and biography. It's a small criticism and one that sadly could easily have been solved in the editing process without detracting at all from the rest of the book. Better than Dangerous Liaisons! A totally captivating book, chock full of interesting details about 19th century English society and mores. A great story of an unsung heroine. This is a brilliantly written, historical account on the life of Caroline Norton, the first woman to change divorce and custody laws in England. Through extensive research of the correspondence between Caroline Norton and her family and friends, the writer Diane Atkinson, illustrates Mrs. Norton's plight as a beautiful society lady, abused wife, accomplished writer and relentless pioneer for all women in Victorian England. No matter how immoral their husbands might have been, women did not have the option to file for divorce, hold any right to their personal property and most of all have custody of their children. Caroline Norton was accused by her slovenly husband of having an affair with Lord Melbourne, the Prime Minster of England, who happened to be a family friend. Although it could not be substantiated in court, the affair stained Mrs. Norton reputation, shunning her from high society and leaving her unable to divorce her husband or receive any support after their separation. Moreover, she was not allowed to see her young children, who were mercilessly mistreated by careless relatives. It is a heartbreaking story, but the genial Mrs. Norton manages to secure a living by writing popular novels, like a 19th century Danielle Steel, and utilizes her wit and connections to finally reverse the law in her favor. Because of Caroline Norton's motherly love, British Parliament granted women the right to raise their children after a divorce and to hold on to their personal wealth. I loved this book and read it from cover to cover! An extremely in-depth look into the life of authoress Caroline Norton and her role in promoting women's rights in Victorian England. Diane Atkinson skillfully utilizes over 1,500 letters written by or to Mrs. Norton throughout her life to illuminate Caroline's difficult and violent marriage to George Norton, the trial for criminal conversation (or adultery) with then-Whig Prime Minister Lord Melbourne, the over twenty-year struggle to gain access to her children and a legal separation from her husband, and her life after the passing of 1857 Matrimonial Causes Act and the 1870 Married Women's Property Act. There were moments where the similarity in names made it difficult to distinguish who did what, but after the first few chapters, it becomes easier to grasp the variety of relationships and people that Caroline Norton interacted with. I would recommend this book to readers with a strong interest in this time period of British history, in Victorian literature or in early women's rights. If I had the option, I'd give this 3.5 stars.Other reviews will tell you more what the book is about.The subject was clearly a fascinating woman who had a colourful, dramatic and traumatic life that deserves being told. However, the books lacks a little focus: it can't seem to decide whether it's a biography of Caroline Norton or more directly aimed at explaining her political/legislative influence given her personal story. If the latter, certain aspects should have been brought more to the fore and tiny little details of her personal life and daily movements could have been edited out. Either way, the title is a bit misleading. Firstly, it assumes she was guilty of criminal conversation (which the author seems to believe is the case, but cannot be proved). Secondly, the trial is only a small part of the book and it's more her treatment by her husband than the trial itself that is the trigger for her activism. A book worth reading - just a little ill-focused and over-detailed in some aspects. The biography of a woman whose deeds should not be forgotten. Caroline Norton (nee Sheridan), grand-daughter of the famous playwright Richard Brinsley Sheridan was the eldest of the three Sheridan beauties. Unlike her sisters marriages, her marriage to George Norton, whilst a disaster, was also the catalyst for Caroline's pioneering work in agitating for law reform regarding the status of women. Criminal conversation was the 19th century term for adultery and George took Caroline to court citing as co-respondent the current prime minister of the day, Lord Melbourne. Despite winning the trial her reputation was effectively ruined; she lost custody of her 3 children, George seized all her possessions (as was his legal right), and leaves her destitute. Caroline's strength and determination to fight for her rights over decades is inspirational. A fascinating book about a sort of accidental hero, one who was responsible, in Georgian times, for changing the law. Feisty and determined, Caroline Norton would not give up her fight to get her three sons back in the midst of an acrimonious divorce from an abusive husband. The 'Criminal Conversation' of the title is the legal term for her supposed adultery with Lord Melbourne, the Prime Minister. Atkinson draws us into the lives of her characters, focusing not only on the scandal and political aspects of the case, but the personal experiences of a mother with no rights to property or, crucially, to her children. The personal tragedy of Caroline and her sons had me shouting at her long dead nasty vindictive husband. Excellent and highly enjoyable account, very thorough research. The tale of Caroline Sheridan's disastrous marriage to George Norton is a perfect illustration of the appalling lack of human rights women suffered - regarded as non persons when married and almost so when not. The irony of living under the reign of the Empress Victoria was not lost her. The law she helped design and promote, to give mothers rights of custody in marital disputes where the wife was not at fault, did not help her personally as her sons lived in Scotland (the law applied to England only). Recommended reading for a biography of an interesting woman and a portrait of a deeply hypocritical and unfair society. What I'm really looking for is a full biography of Catherine Norton, but I guess this is all there is?She wrote plenty about the details of her troubles in her -- political tracts? editorials? hard to define -- but I'm curious for, firstly, an objective view, and secondly the rest of the story of how she handled the problems she was stuck with, like debts and getting her children settled later.Their trial is the most famous thing about her, so, I guess that's why there's this. The first third regarding the trial for criminal conversation-the meaning of that term and it's implication are astonishing- is richly informative and engaging. Last two thirds lose focus in the chronological details of Caroline Norton's life, diminishing the important contribution she made in the movement towards justice for women. Mr Norton was an evil man bad to his children and vindictive to his wife. All based on primary sources. Written well providing true historical account how women were non-entities with no rights. Mind blowing how feminism is important and we must protect our rights. Start now by protecting our reproductivevrights that are being taken away. A must-read for women today, particularly those who would sell short a woman's rights within a marriage. What Caroline Norton suffered for us needs to be recounted and recounted, lest we forget and allow the power-greedy to take back from us. I won this book via Goodreads First Reads Giveaway. I received a paperback copy. This. Is. Awesome.Lots of historical detail, anecdotes, information & it covers so much of legal importance to today's women. I wanted the book to get further into legislation than it did, but once we got past the Infant Custody Act, it was a fairly standard biography and the writing wasn't that interesting, alas. Well written, thought provoking and informative. 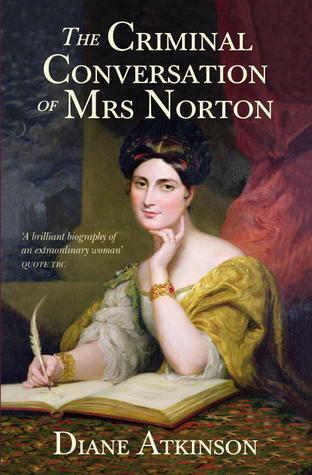 I has never heard of Mrs Norton before reading this book and I am surprised she has not been as well remembered as she probably deserves. A fascinating bio of a remarkable woman. Mrs. Norton changed the lives of countless women to come with her strength and bravery. Her life was filled with tragedy, but she used that to make the lives of others better.